Unexpected Bee & Wasp Visitors? Effective wasp and bee removal is essential to ensuring the comfort and safety of your guests. Bees and wasps have the potential to be dangerous when they are provoked or threatened. Although bees are necessary pollinators and have numerous benefits to the natural environment, the moment you discover a beehive right outside your front door, they’ll seem more like pests than a beneficial insect. 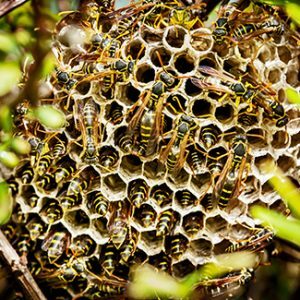 Not only can the sheer number of them be bothersome, but stings can cause allergic reactions in quite a few people, making bees and wasps one of the more dangerous pests for homeowners and businesses. Our team of professionals is especially equipped to handle these flying insects, whether they’re located inside or outside of your home or business. For 25 years, we have specialized in wasp and bee removal, and we would love to help you with your infestation. We’ll monitor where the bees or wasps are most active and pinpoint the areas of access to your home. After eliminating the hive or nest and eradicating the population, we’ll give you some prevention tactics so you don’t have another nest pop up in a different location. Don’t risk your health – contact our wasp and bee removal team for prompt and reliable service now.